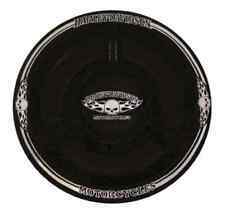 Harley Davidson chip n dip plate. Get laughs as you serve guacamole in this funny serving bowl and spoon set. Silver-plated serving spoon reads "Holy Guacamole". Health & Beauty. Excellent. Never USED. Was too pretty to take a chance and get chips. These plates are HOT....HOT....HOT!!! From World Tableware, you'll love serving appetizers and dips in these stoneware chili pepper plates. Discontinued and hard to find! The large one of 12 3/8" and the small ones are 5 1/8" in length. Large one has a well for dips at the top and there's plenty of room left for chips. Carefully packaged and shipped by Home4Dinner. Nambé Nambe Braid Condiment Server (4 pc Set) by Sean O'HARA - MT0635 - NEW! By Sean O'HARA - MT0635. Nambe is hand-crafted, no two pieces are exactly alike. I will try very hard to rectify a problem, if you think there is a problem. Ordered by mistake. Non receipts of order or order/item problems/discrepancies have to be. 5 out of 5 stars - Nambé Nambe Braid Condiment Server (4 pc Set) by Sean O'HARA - MT0635 - NEW! 1 product rating1 product ratings - Nambé Nambe Braid Condiment Server (4 pc Set) by Sean O'HARA - MT0635 - NEW! It has a reflective surface that shines and will not rust or tarnish (no polishing required!). The tray can be heated or cooled along with the dish to help keep it's temperature. Will not break, chip or crack. Mexican Talavera Pottery Chip and Dip Serving Dish Plate Taco 7 Piece Set - 12"
Remove the sectional dishes and you have a beautiful serving platter! Lead free and dishwasher safe, although hand washing is preferable. A work of art! Due to the nature of hand painting, each piece of Talavera is unique and beautiful, variations and imperfections are to be expected and are normal. For an outstanding value, check this attractive October Hill porcelain chip and dip bowl set. The set consists of a a chip bowl and a small dip bowl. Both pieces feature a glossy glazed white finish. 2 Piece Chip and Dip Set. Includes removable dip bowl. Hand wash. Very gently used, clean and ready to use. A few slight surface marks. Australia, Belgium, Brazil, Canada, Croatia, Denmark, England, Estonia, Finland, France, Germany, Gibraltar, Great Britain and Northern Ireland, Hungary, Israel, Italy, Latvia, Lithuania, Luxembourg, Malaysia, Malta, Netherlands, New Zealand, Portugal, Singapore and Spain. Gently Used Williams-Sonoma 7 1/2" Round x 1 3/8" High Terra Cotta Southwestern Design Single Serving/ Chip and Dip Bowl Dish Platter. Light wear due to age/use/storage. Pleas e use zoom feature when available to further examine details as not every blemish may be specified or noticed. Salsa and tortillas, fruit and yogurt, veggies and dip or whatever else you can think up. the smaller bowl for the dip is 4 1/2" across the top and 2" tall. Good and solid when picking up, so you won't spill your goodies! For sale is this NEW B. Smith Multiserver. These are white porcelain bowls and a bamboo base. There are 5 bowls and one base. What is the history of the item?. We test them and picture their current condition. 2 Piece Ceramic Mosaic Pear Chip 'N Dip Set Hand Painted by Clay Art San Francisco, has tiny chip along the edge, where the blue paint is, but the chip is very small and hardly noticeable. Great deal for this gorgeous pair of pears!!! Ozark Missouri. Two Tiered. Walnut Wood. Serving Bowl. Mid Century Modern. A couple light scratch marks. You can view this in the last few photos. Wilton RWP De Sousa. A very versatile piece. Fruit, Shrimp, Chip and Dip. Extra Large Platter. See photos for condition details. The perfect serving piece. Serving Tray. Cooking and Serving Safe. Featuring 3 white porcelain trays, the Appetite 3-Step Server makes an elegant presentation for arranging food and snacks. The trays rest on a chic, copper stand that creates a tiered effect and adds space-saving style. Bico 5 pc Condiment Serving Set, No Box, Brand New! The set includes 4 bowls with a 13.5 oz capacity and a serving platter. This is one classy beautiful lazy Susan with spaghetti drizzle milk glass crescent shaped slots surrounding a blown glass bowl set upon a handled Swivel lazy Susan. Shrimp 🍤 and cocktail sauce. Veggies and dip. 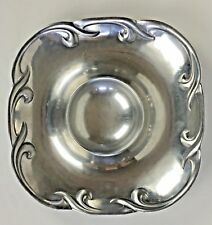 Rare Wallace Huge Baroque Aluminum Serveware Chip & Dip, 16 1/2" x 16 1/2"
Rare Wallace Huge Baroque Aluminum Serveware Chip & Dip, 16 1/2" x 16 1/2" x 4" High, 6 lbs weight . This is a Rare Wallace Huge Baroque Aluminum Serveware Chip & Dip, 16 1/2" x 16 1/2" x 4" High, 6 lbs weight. Give us a shot and we will make sure that you will look to us again! You're already purchasing the item. Has only very light wear and use. ~ What you see in the pictures provided is what you will receive. Vintage Large Ceramic Pottery Art Flowers Chips & Dip Serving Bowl. Condition is Used. Very neat very heavy piece. Shipped with USPS Priority Mail. Dip bowl holds about a cup. See photos. I can make a mistake - and I can fix one too! ONEIDA GEORGIAN SCROLL CHIP AND DIP SERVER. THE SILVER CUBE ONEIDA SILVERSMITHS MARK OF EXCELLENCE. Or for quick chill, put a couple of ice cubes inside of the bowl, let it set for a minute and you will have a chilled bowl for seafood or any cold food, it will keep your food cold for about half hour. 5 wooden nesting bowls. Bowl sizes from largest to smallest are All bowls are in pristine condition. See all pics. Beautiful set to add to your kitchen. We do our best when restoring or upcycling and we make mistakes. Pottery Barn TROPICAL LEAF ~ 3 section server. Arthur Court Floral Pattern Chip & Dip Serving Tray Bowl 14" Diameter EUC! See pictures for the exact item you will receive. Used maybe once, twice at the most, and shows minimal signs of usage. Inscribed and signed on the bottom, dated 2002. Plastic football opens into two10" x 6" oblong containers. 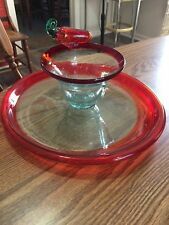 Pottery Barn Great White Porcelain Chip & Dip Bowl Large 15.5"
Regent Gallery 2 Piece Glass Vegetable, Fruit, Chip 'N Dip Set. 5.5" Dip Bowl. Box is beat up from being in storage for 25 years. Only used once. 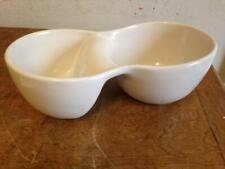 CRATE AND BARREL POPCORN BOWL/SERVER in White ceramic. As a bonus, 4 smaller plastic bowls have been added. Designed for decorative and practical use. · Hand wash with mild soap and hot water; towel dry. They are always found in a circle with W usually larger than the R and P. Generally found on the bottom or the side of an item, the mark varies in size on different pieces. Authentic marked RWP, The Wilton Co. In very good pre-owned condition. Appears to be unused. Includes original box, however the box has wear. Made in China. With its mood of counterpoint and connection, the Dharma Chip and Dip bowl adds a reflective beauty to the pleasures of snacking. The mix of materials is arresting yet harmonious, and the nesting oval silhouettes add to the design’s flowing appeal. Very nice, kind of unusual stoneware set. International Priority is FAR superior in many ways, but expensive, I know. No maker’s mark.